The site of one of the earliest known Assemblies or ‘parliaments’ in the UK has been officially put on the map after years of work by a scientist from The University of Nottingham. 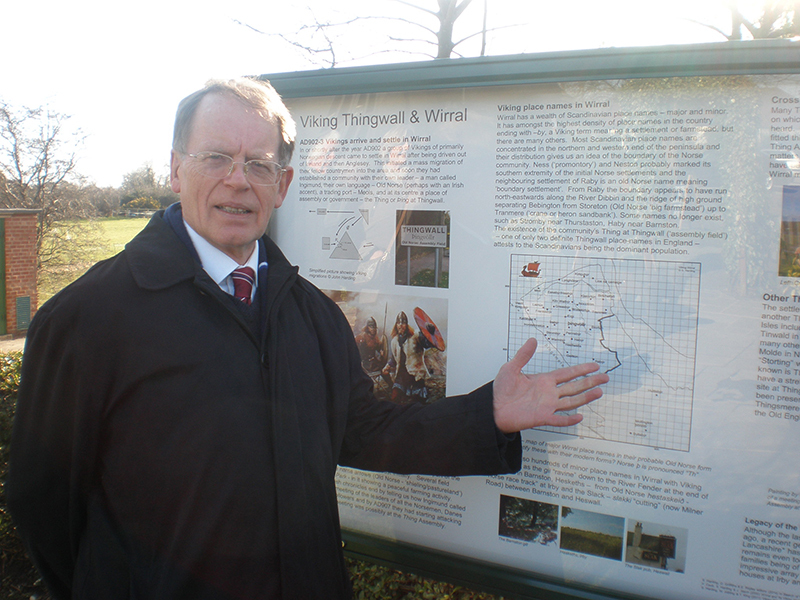 Professor Steve Harding has unveiled a new historical information board to mark the Viking ‘Thing’ or open air ‘assembly-place’ in the village of Thingwall on the Wirral in the North West of England. The Professor, together with his colleague Professor Judith Jesch, Director of the Centre the Study of the Viking Age, has been researching the Viking heritage of the North-West of England for many years and has been working tirelessly with local councils and heritage groups to make this legacy much more visible to the modern population. The Vikings arrived on the Wirral in AD902 and their presence remains in the genes of old Wirral families with up to 50% of their DNA being of Norse origin, according to Steve’s previous genetic mapping research with colleagues from Leicester. The board has been designed by Steve with help from the Irby, Thurstaston and Pensby Amenities Society. It tells the story, with pictures and maps, of the Viking migration from Norway to the Wirral and their settlement and influence on the area over time. The Vikings soon established a community with their own leader, a man called Ingimund, their own language (Old Norse), a trading port on the Irish Sea at Meols and a place of assembly or government, the ‘Thing’ at Thingwall. The linguistic legacy is also seen in place names like Tranmere, Storeton and the many villages like Frankby, West Kirby and Raby ending in ‘by’, Old Norse for settlement or farmstead. Plans are now under way to secure the necessary permissions to build a ‘heritage trail’ path from the pub to the top of the Thing mound to allow visitors and local people to literally tread in the footsteps of their Viking ancestors.